Opponents jump on their inflated horses and hop down the race track! Have some fun with Inflatable Horse Racing! Riders will have a blast hopping down the racetrack as the crowd cheers them on to a photo finish in the Fun Derby. Riders sit on inflated bouncy balls with handles and hop down the racetrack against two opponents, as they attempt to cross the finish line first. 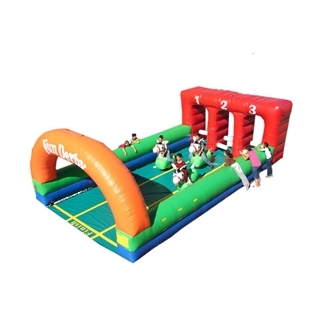 The inflatable racetrack features three lanes for three riders at one time. Fun Derby is great for all ages.